As you've probably heard by now, this site will be relaunching under the name Line Of Action on November 24th. With the new name comes an all new look and totally rebuilt drawing tools that incorporate many of the features you've been hoping for for years. Last week, we took a look at what's in store for the drawing tools themselves. This week, I wanted to offer a peek at the new look of the site. While the layout remains very similar to what you're used to, the overall aesthetic is cleaner, more modern, and easier to read. Special attention has been paid to making it easier to find and update information about your own account -- while logged in, links to your account and profile information will be visible both in the side bar, and in a new menu in the top navigation. And a greater emphasis has been placed on featuring recent forum posts throughout the rest of the site, to make sure you get the feedback you're looking for faster. 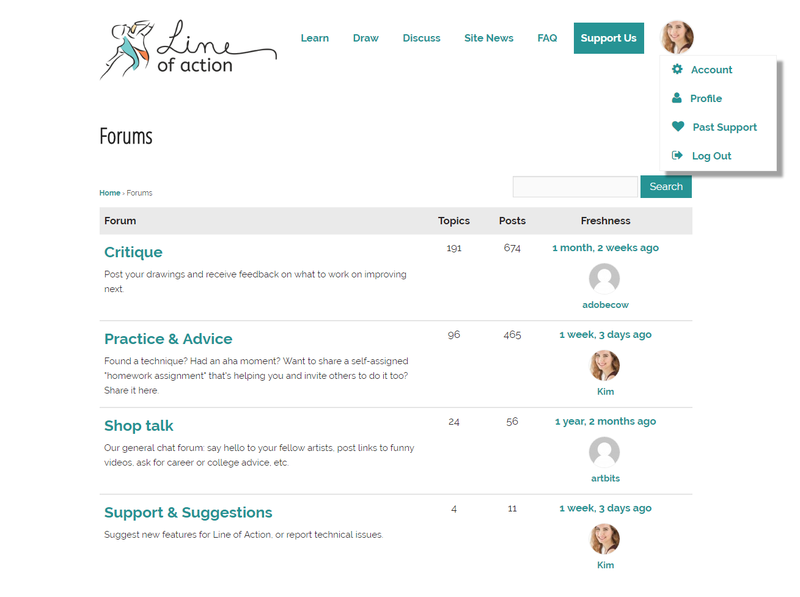 We've also added a new forum called Support & Suggestions, which should help to keep the Shop Talk forum clear for friendly chit chat. Plus, it will be easier for us to immediately see and address any problems you're experiencing or ideas that you have. I'm so excited to be able to share the new site with you. Just 14 days left until relaunch! Comments on "A sneak peek at the new site"